Abigail was born in Sussex but has had a life-long love of Cornwall. She finally moved in 2005 to (ostensibly) work at Rick Stein’s restaurant but in reality to be nearer to her Cornish boyfriend, Jeremy! 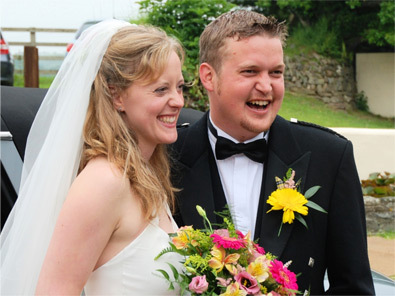 They married in the summer of 2007 and with a brief stay in nearby Mitchell moved to Tregony the following year. Their first Christmas at Lynwood was celebrated by the birth of Megan, and three years later, again just before Christmas they celebrated the arrival of Seth. Jeremy has lived locally all his life, he works as a Chartered Surveyor and as of 2017 has become a Director at Edward Buckland. With his love of the countryside and all things Cornish he is an excellent resource for local information, especially Caerhays, which is one of the estates he helps manage. The pair of daft and bouncy spaniels, Dylan and Cecil, pictured here live outside as they are trained gun dogs and take their shooting duties rather seriously. Lynwood is also home to two guinea pigs, Daisy and Lily and a very inquisitive Jack Russell, Buzz, who lives inside. With such a busy household Abigail regrets that they are unable to accommodate visitors’ dogs in the B&B or the Studio but for those of you who do have a four legged friend who likes to come on holiday too, there is Frogmore Corner the ‘dog friendly’ cottage across the field. 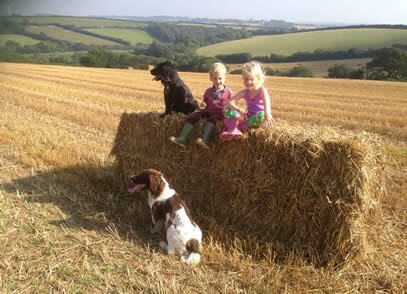 Frogmore Corner is owned by Abigail’s parents and is available all year round for short breaks or weekly lets.